The global professional services company Accenture sought to automate access to HR services for all Japanese employees. To achieve this, the company tapped NTT’s conversational COTOHA solution which is powered by IPsoft’s Amelia. 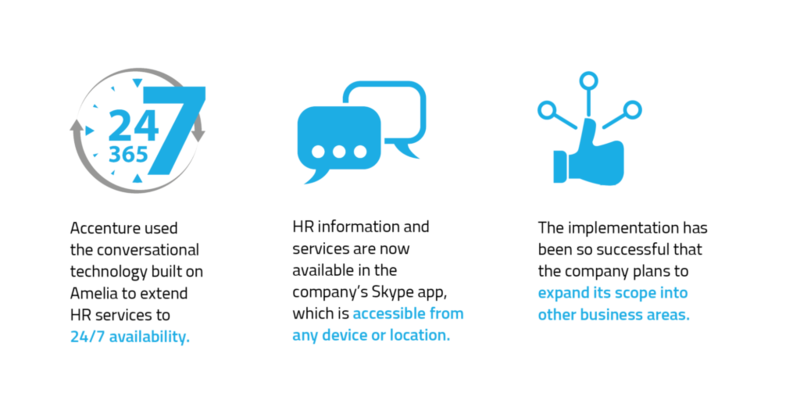 Accenture launched its Skype-based virtual assistant in 2017 to provide employees with 24/7 access to information related to payroll, vacations, training, life events, career path, and health. The virtual HR concierge is named “Randy-san” in honor of a former long-term employee who had a reputation for knowing everything about the company’s internal processes. Before the virtual HR concierge, employees needed to contact a member of the HR team during business hours in order to locate relevant information. Now they simply ask Randy-san for information through a chat interface 24/7. With Randy-san, the company has been able to increase employee productivity by opening access to information 24/7. the answer or guide employees to the relevant website for additional resources. If the employee is not able to find an answer to their question, Randy-san will connect them with the relevant contact. With Randy-san, the company has been able to increase employee productivity by opening access to information 24/7. The company has plans to extend Randy-san’s scope to other business areas in the future.